You will not read much on this topic in regard to orchids for there has been little research done. As so often is the case, the myths and misinformation get spread widely, often by people selling something. However, this much is true: Magnesium is an essential element in orchid nutrition. In Europe, fertilizer formulas are often expressed as N-P-K-Mg, indicating that it is considered as a macroelement rather than a micronutrient. 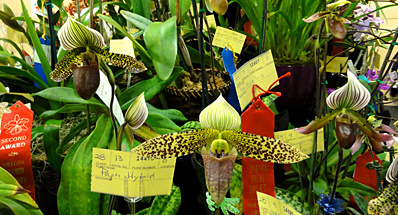 It can be made available to orchids in many forms. Potting mixes will often contain dolomitic lime for a slow-release source. Growers either top-dress with magnesium sulphate in the spring or they apply it dissolved in water in the autumn as a stand-alone application at 1tbs per gallon. Sophisticated growers will usually add magnesium in a chelated form to their liquid-fertilizer solutions. Plant need can be gauged by tissue analysis but this is probably more complex than most hobby growers can be bothered with.